I'm currently trying to dissect a steam heating system built in the 1930's in NYC. Mostly I want to know if this is a two-pipe or a one pipe system. 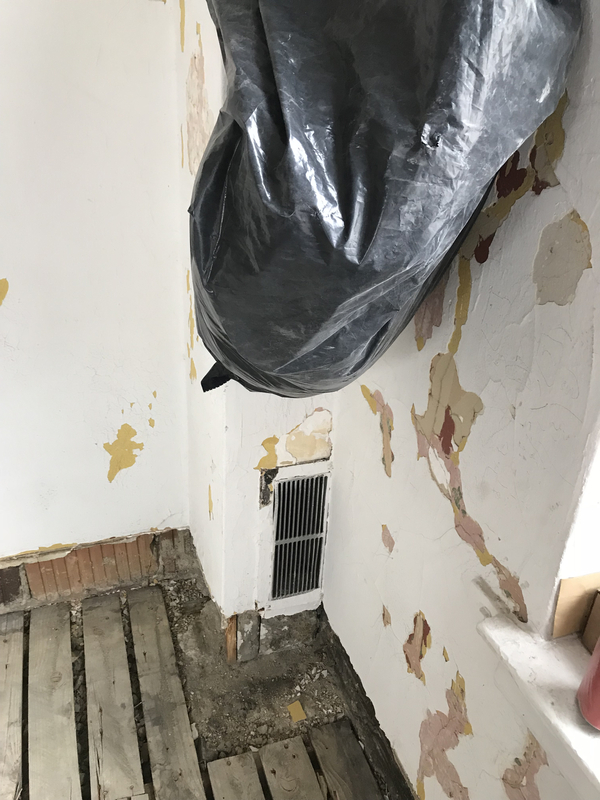 90% of the building has vertical radiators in the apartments without steam traps and the lower floors contain some radiators with steam traps and some with air vents. It's all very confusing and counter-intuitive to what I know. It seems like there were a lot of hands in here changing things from the original design. After doing some searching online and on this wonderful site, I stumbled on the "Mill's System" which is a one-pipe down-feed steam system. I suspect it could be some variation of this, but there are no air vents or steam traps on 90% of the radiators. Also, there is a vacuum pump on the return, so I'm thinking it can't be a one-pipe. You have more sleuthing to do -- and some pictures would help a lot. It's probably some sort of Vapor system that used either special return fittings instead of traps on the radiators (as Broomell, Kriebel or Richardson) or orifices in the radiator supply valves. These devices would keep steam out of the dry returns, unless the system was designed to allow steam to enter them as the Kriebel was. "One-pipe" and "Two-pipe" refer to the number of pipes connected to each radiator. This is easy to determine. 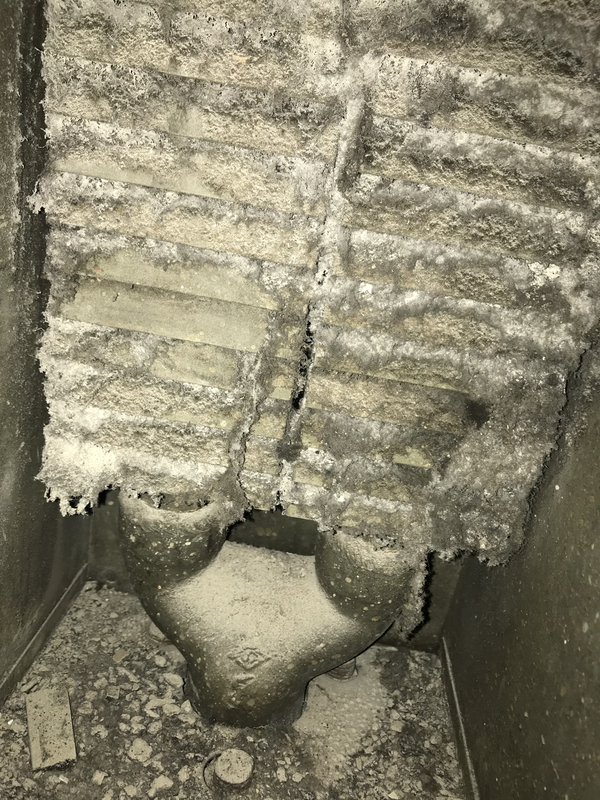 If there is only one pipe connected to a radiator and no visible air vent, it probably has a hidden vent such as an "In-Airid". Take some pics and post them here. We're looking for names or trademarks on the original radiator valves, return elbows etc. as well as any real old stuff in the piping around the boiler. Good stuff. Makes a lot of sense. 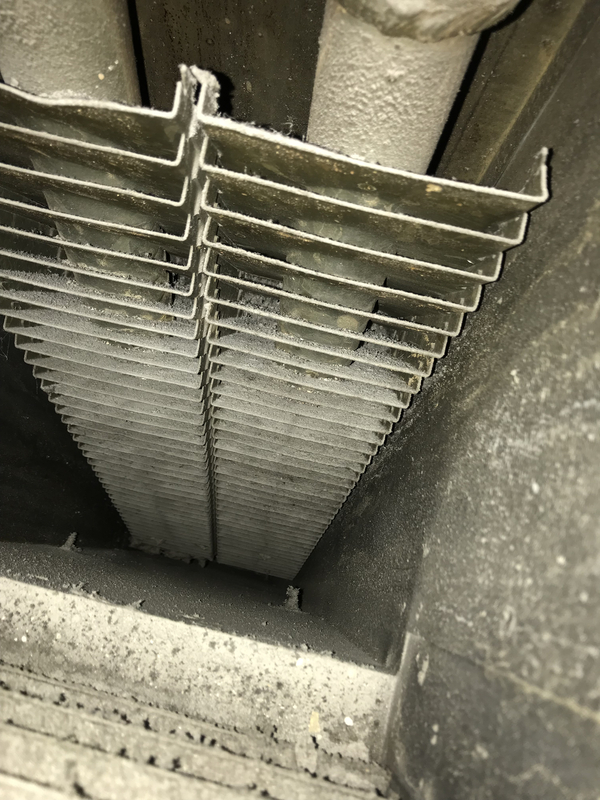 Check out some pics of a vertical radiator. I don't see any traps or vents on these. 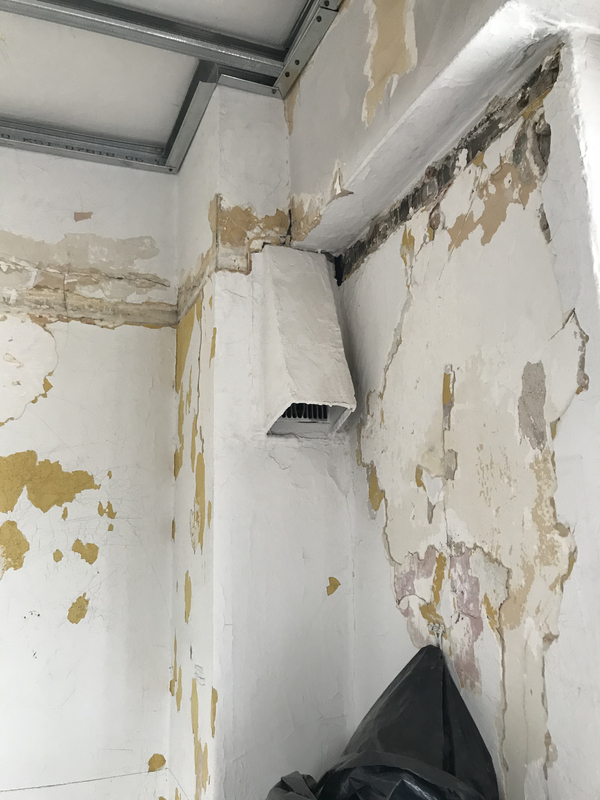 Where does that duct go once it gets above the radiator? Steamhead - these are in the apartment walls. So there is a vent at the bottom and one at the top, to promote natural convection over the fins. So, basically a vertical in-wall convector. If there is no vent on top of that "convector element", as it's called, the only way it could work is if there are two pipes connected to the bottom. One would supply steam and the other would take away the air and condensate. I've seen convector installations where the traps were installed below the floor. See if you can get underneath this one and take a pic of what you find. Right, I see one large piece of iron at the bottom of the unit. But that's big enough for two smaller pipes to come down under the floor where we can't see them from this angle. Nice fitting. Looks like steam is moving in one direction and condensate in the other direction. In the same fitting. I have seen such fittings on gravity hot water systems. Never on steam. I'll see if I can pry a little deeper. There's definitely something going on here that's not in plain sight. Remember- there HAS to be a way for air to get out of the element. Otherwise steam cannot enter it. If there is no vent on the element (double-check the top of it) then there has to be a return line. Do I vaguely remember a system -- Paul system? Which used very small vent lines to a vacuum pump? Really interested to see more pictures. Never seen anything like this before. Tempted to come up to NYC to see it! This might be a Metro system by Dunham Bush. Thanks! I believe I've heard of this type of system. What makes this different from a traditional two pipe? Dunham Bush offered that as a less-expensive alternative to their Vari-Vac system. They sold a lot of them in Philadelphia. 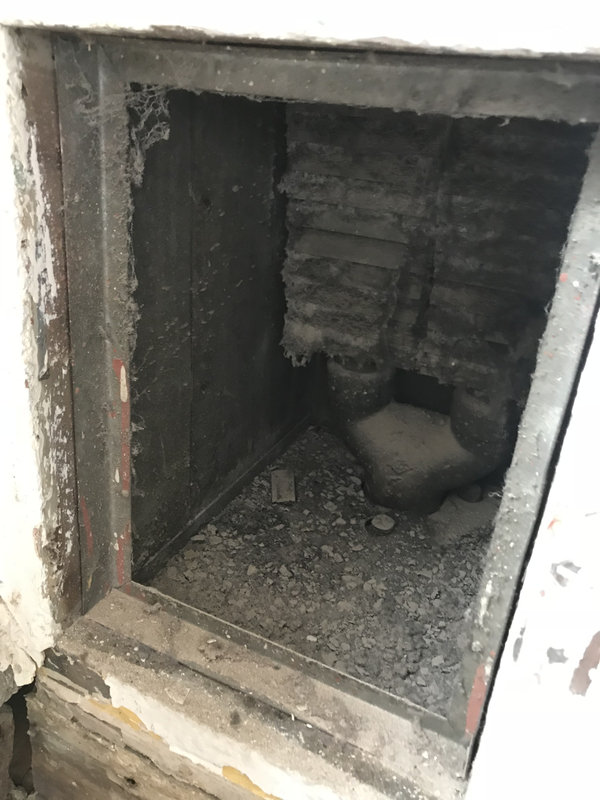 The boiler had a main riser that went to the top of the building and then downfed the two-pipe radiators, which had no steam traps and no air vents because this was a vacuum system. The steam would just fall from floor to floor, taking the condensate along with it. The lower floors heated with a combination of steam and hot condensate. At the bottom of each downfeed riser there was a float&thermostatic trap for the whole riser. These would then send the condensate to the vacuum pump, which returned it to the boiler. It was variable-vacuum, but without the expense of the radiator traps and some of the controls the Vari-Vac system offered. I hope that helps. And if it's not what you have, it's still good stuff to know. Thanks Dan and everything. I think that definitely could be the case here. With a system like this it doesn't seem like you can do any balancing (orifice, TRV, etc.) because all of the radiators are in series. The only cure for overheating is adjusting controller set points. Yes, or opening the windows. That's why we don't see many of them these days. Thanks a lot Dan. Gonna take a read through "The Lost Art of Steam Heating". I know it's floating around the office somewhere! Some might say it's "lost". I doubt that's a Dunham Metro setup, unless the element is fed from the top. The Metro needed a constant downward pitch from the top of the building down through all the convectors to the trap at the bottom. If this element is fed from the bottom, it can't be a Metro. Also, according to one of my Dead Men's Books, the Metro piping setup was first used in 1941. So if this building is older than that, it's probably not a Metro. Thanks for that, Steamhead. I thought the feed was from the top. There is an expensive old condo here that has a one pipe system with a vacuum system. There is a 3/8 pipe that goes to near top of the rad and has a bimetal plate in it. When the boiler/boliers are started the by the stationary engineer, the vacuum pump is activated. It accelerates the entry of steam into the radiator and then the bimetal caps the vacuum. Then the system works as a regular one pipe. Don't think anyone is sure at this point. When I look at the pics, the bottom of the element looks like it's big enough to have two pipe connections underneath. You'd only need a 3/4" supply and 1/2" return to make it work. This is a pretty unique setup. The element is definitely special, because of the way the fins are slanted. It was clearly designed for this type of installation. I'll be interested to see @mgeraci 's next set of pics. I wondered if this might be an early "Slant/Fin" product, but IIRC that company didn't start up until the late 1940s. That's probably a Paul system. See Lost Art for details. In Toronto there were apartments with overhead distribution,usually separate steam connections to terminals –in at top & out from bottom– but no conventional traps. System of pipes and tanks in boiler room enabled an eductor to evacuate air yet allow gravity to return condensate into boiler. I've given up trying to reconstruct from memory how that was accomplished. I think that at least one building was one pipe in the sense that steam and condensate went in same stacks. The designer varied those details to see which was least expensive to install. I'm pretty sure these are fed from the top. The radiator is vertical inside the wall. Where can I read more about Metro Systems? I think Steamhead said he had something in writing about them. I have only memories.